Developer Steve Troughton-Smith has explored the code and found that HeadBoard, tvOS' UI, includes support for folders. Yesterday, Apple seeded the first beta of tvOS 9.1 to developers, the first software update to tvOS 9.0. 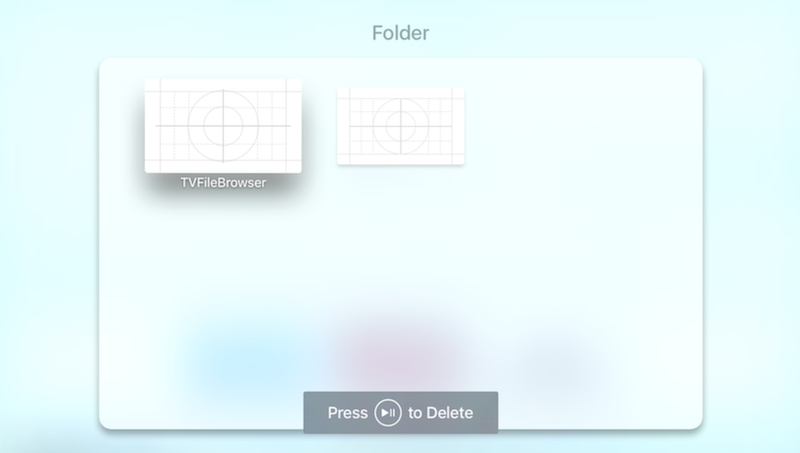 Folders on tvOS currently work in a similar way to iOS, notes Troughton-Smith. A user would just have to drag one app over the other to create a folder. Users would also have the ability to rename folders. Troughton-Smith was able to activate the folders using the LLDB software debugger. The folders appear to use a 3 x 3 layout and sit alongside apps on the Apple TV's home screen, just like folders do in iOS. In recent days, Apple has been updating the Apple TV's new App Store with Top Charts and Categories for better discoverability. However, those updates were server-side updates that didn't require users to update their software. Folder support would require a software update, but it's unclear which software update Apple would enable it in. Last year, iOS 8 code pointed to split-screen multitasking, but the feature didn't become official until iOS 9 almost a year alter. Correction: An earlier version of this story wrongly indicated that Steve Troughton-Smith had found the code for tvOS folders in tvOS 9.1. He found the code in the public, released tvOS 9.0. I just need Bluetooth keyboard support and an update of the remote app. Twenty-four letters between A and Z? This is probably the worst on-screen keyboard I've EVER seen. Seriously, I've had this thing for 4 hours now and I'm pretty much ready to send this thing back. It's like someone was intentionally trying to make it bad. And just so no one could be happy, they threw away the bluetooth support for keyboards and didn't bother to update the Apple Remote App! I can use my iPhone to type on my TiVo, how does it not work on the Apple TV?!? In Apple new products are developed in secret separate teams so usually these first-gen products (e.g. iPad 1 - stuck in iOS 3.2 for a long time even after release of iOS 4, Apple Watch - native apps, and of course, all sorts of problems with the new Apple TV) seem to be out of place with the current lineup. I feel like someone put the AppleTV dev team in a locked windowless shed for the last three years, and they just recently came out for air, and was puzzled as to why no one had told them about TouchID, iCloud Keychain, iCloud Photo Library and Apple Music. Pretty inevitable with the forthcoming rush of apps. I hope apple does not change the on screen keyboard due to the complainers. It's much easier to navigate as a single line. After being trained by this hideous one line alphabet touch pad remote flicking keyboard, everyone will be a ninja in using the Siri remote. It's planned. This Apple TV thing surely is not what Steve Jobs said he cracked it in the Biography. It's not 3x3 now on an iPad. I feel like, that is when Apple will kick tvOS into overdrive.